New South Wales is a step closer to implementing a shake-up of transport laws that will ready the state for the introduction of national heavy vehicle regulations. The Legislative Council yesterday began debate on the Road Transport (Repeal and Amendment) Bill and the Road Transport (Statutory Rules) Bill, after both pieces of legislation passed the Legislative Assembly last month. The bills consolidate a number of existing transport laws to improve consistency and reduce complexity. The Road Transport (Repeal and Amendment) Bill will rename the Road Transport (General) Act as the Road Transport (Vehicle and Driver Management) Act and confine its operation to mass, dimension and load requirements for heavy vehicles and to regulating fatigue management. Roads Minister Duncan Gay says separating the heavy vehicle provisions in the Act paves the way for NSW to adopt the Heavy Vehicle National Law (HVNL). 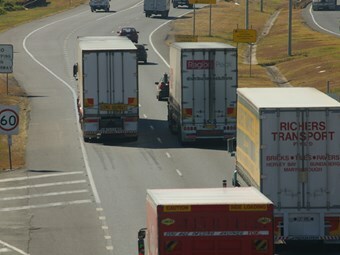 The Act will govern heavy vehicle regulations until the HVNL is introduced, at which point the Act will be repealed. "These bills not only cut the number and reduce the volume of statutes but also remove anomalies, inconsistency and a degree of complexity in the legislation that impact on every citizen in NSW," Gay says. "It is important that, despite its complexity and breadth, the law should be able to be accessed and understood by road users in order that they understand their rights and obligations." Gay says obligations on road users are spread across a number of acts and regulations, while there are different definitions for a number of terms. "Provisions relating to demerit points are similarly scattered and it is difficult for road users to understand what applies to them," he says. The Opposition has backed the reforms, along with the Greens and the Christian Democratic Party. "The Greens believe it is common sense to have uniformity of heavy vehicle laws across the country as that will make it easier for operators and drivers. We can see the benefit of national consistency in laws in this area," Greens MP Cate Faehrmann says. She joined Christian Democratic Party MP Fred Nile in seeking greater effort from the NSW Government to shift more freight on rail to reduce truck numbers. "The Greens suggest that the Government is not doing enough to move freight onto rail and to give industry as much incentive as possible to move its freight by rail," she says. "We seem to be doing everything we can to build bigger and better roads thus ensuring that we do everything for the trucking industry." Debate on the bills has been adjourned.